We teach OSHA-approved lay responder (or workplace) CPR and First Aid courses for all national providers of emergency service training courses. That includes: American Safety & Health Institute (ASHI), and American Heart Association (AHA), American Red Cross (ARC), and National Safety Council (NSC). All of our First Aid and CPR courses are OSHA-approved and most importantly meet the licensing guidelines of all U.S. sports and fitness licensing organizations. Namely: Amer. Council on Exercise (ACE), National Academy of Sports Medicine (NASM), National Strength & Conditioning Assn. (NSCA), National Exercise Trainers Assn. (NETA), Aerobics & Fitness Assn. of America (AFAA), American Fitness Professionals Assn. (AFPA), American College of Sports Medicine (ACSM), and International Sports Sciences Assn.(ISSA). 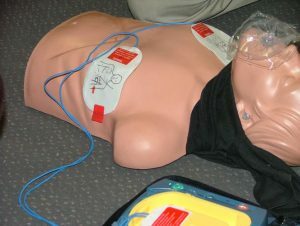 This category of CPR & First Aid courses is NOT for nurses or EMTs, or doctors or dentists. Because, all of those occupations and students in those healthcare disciplines MUST have AHA BLS for Healthcare Providers course. BLS courses are not the same. (As a result, AHA BLS is the ONLY BLS course we will offer). The lay responder category of CPR and first aid courses are for the general public, families, warehouse employees, other OSHA worksites, and gyms, fitness centers, day care centers, etc. These CPR & First Aid courses can be taught either at your business, onsite, for your employees, or you can enroll in a public class, listed on our schedule. We are an ASHI-approved Training center. Therefore, we offer “end-of’class” certification. We are also an AHA-approved Training Site. That means we can provide “end-of’class” certification cards for all AHA or ASHI courses, healthcare provider and lay responder CPR and first aid. 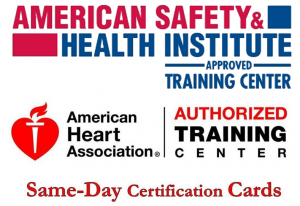 As a result, we also offer same-day AHA certification cards. Many instructors at other agencies can only get the students address, and mail the certification card 4-5 days after the class – we NEVER do that. Students ALWAYS desire to get their certification card the same day they take a course.